Posted by dr. gonzo in Black Hawk War, History. Illinois was a very different place in 1832, open, sparsely settled, and filled with fear. That year the Sauk chief Black Hawk made an incursion into Illinois in violation of what he saw as unfair treaties. The incident sparked a war that ended in tragedy throughout northern Illinois and present-day southern Wisconsin (then Michigan Territory). I researched and composed most of the extensive material on Wikipedia concerning the Black Hawk War, I put a lot of energy into it’s accuracy and referencing. There were numerous attacks, ambushes and massacres during the war and the action spread into the area known as Buffalo Grove, which is near present day Polo, Illinois. The incident is known as the Buffalo Grove ambush (see wiki by me), or the Buffalo Grove massacre (a misnomer since only one person died). It happened on May 19, 1832, shortly after the start of hostilities at the Battle of Stillman’s Run (see wiki by me) in present-day Ogle County, Illinois, not far from Polo. A group of 6 Illinois militia was ambushed by what was probably a rogue group of Kickapoo near a small settlement called Buffalo Grove (wiki), which had been mostly evacuated. One of the militia men was killed, William Durley. Today, the marker pictured above is located over his burial site. 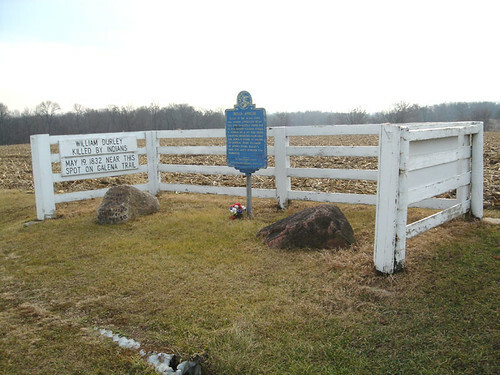 The marker was erected by the Polo Historical Society in 1910, at that time Durley’s remains were moved to the site of the marker. *Wikipedia: List of entries related to the Black Hawk War, mostly by me and vetted closely for accuracy, good resource. Look for more about the Black Hawk War in the future. In the meantime, we will venture back to my area. I lived in Polo on the Grossnickle farm and attended Polo High before joining the Navy in 1954. I never realized this was there untill finding it on the computer.